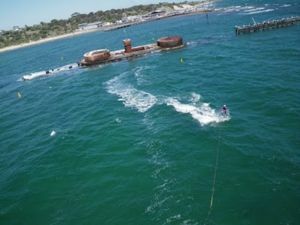 Victorian kitesurfing locations are many and varied. This article provides a summary of locations, their best wind direction, and links to other information. Disclaimer: Verify site information with locals or someone who has kited there before heading out for the first time at a new location. Altona Beach. Wind SE, SW, S (onshore). Intermediate and above. Sandridge Beach. Wind S (onshore) to SE. Small surf. Intermediate and above. Port Melbourne. Wind SW, S, SE. Small surf. Intermediate and above. St Kilda. Wind S to SW. Beginners and above. Brighton. Best wind S to SW. N, NW, W (onshore) possible for advanced kiters. Reefs. Hampton. Best wind S to SW. W (onshore) for advanced kiters. Small surf. Ricketts Point - Advanced only. Cliffs and reefs. Popular with windsurfers. Aspendale/Gnotuk Ave. Best wind S to SE. SW (onshore) for advanced kiters. Frankston. Best wind NW and SW. W (onshore) for advanced kiters. Torquay. Wind SW or S. SE (onshore). Surf. 13th Beach. Wind SW or SE. S (onshore). Surf. Ocean Grove. Wind SW or S. SE (onshore). Surf. Anglesea. Wind SW or S. SE (onshore). Surf. Apollo Bay Wind SE, NW, E (onshore). Surf. Long day trip from Melbourne. Portsea Back Beach. Wind W or S. SW is onshore. The Mornington Peninsula back beaches are not for the faint hearted or beginner. Inverloch (inlet). Wind SW, SE. S (onshore) for advanced kiters. Sandy Point (inlet). All wind directions possible. Long day trip from Melbourne. 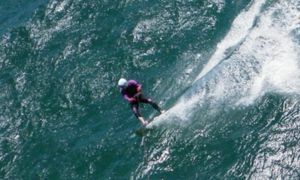 Seabreeze, forums on kitesurfing, windsurfing and other watersports and wind forecast maps. This page was last modified 21:21, 24 January 2014. This page has been accessed 88,968 times.